Need a new idea for this year’s Cinco de Mayo celebration? 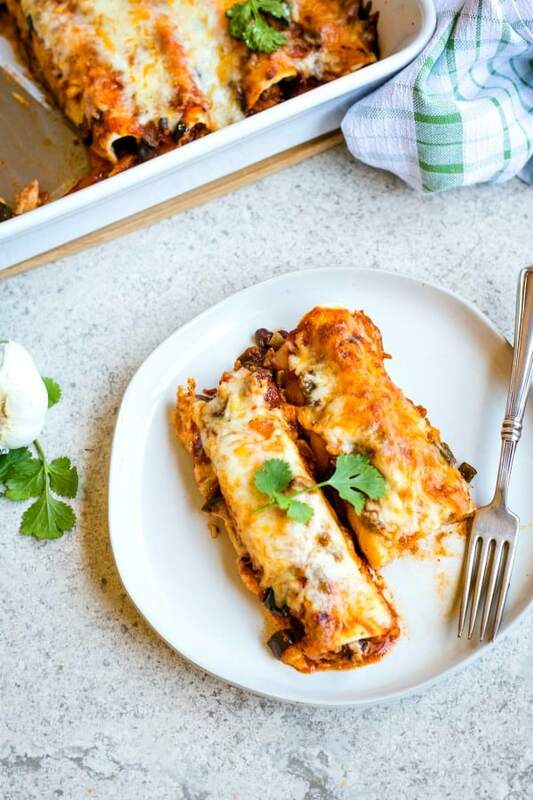 How about these Chicken Black Bean Enchiladas with a chunky homemade enchilada sauce made with onions, poblano pepper, and smoky chipotle chilies? If you like more spice, adjust the heat to your liking by adding more of the chipotle chili Adobo sauce. Depending on your preference, this chicken enchilada casserole can be made with either flour or corn tortillas. If you are prepping for a party, the sauce and filling can be made ahead of time, but you’ll want to assemble the enchiladas just before baking for the best results. 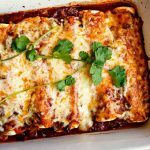 For a couple of years now Cheesy Chicken Enchiladas has been THE all-time favorite recipe at Life, Love, and Good Food. I’ve made it over and over again and it certainly is delicious, but I’m also loving the smoky flavor in the homemade sauce found in today’s enchilada recipe. When it comes to enchiladas, our family has differing opinions. John and I prefer our enchiladas made with flour tortillas while our girls like corn tortillas. I like my enchiladas soft and creamy, but John likes them to be a little crunchy. In my opinion, crunchy enchiladas are not enchiladas, they’re chimichangas! Either way, making enchiladas at home isn’t that difficult — a little time consuming maybe, but not difficult — and they’re a delicious and fun meal to serve! Make the enchilada sauce. 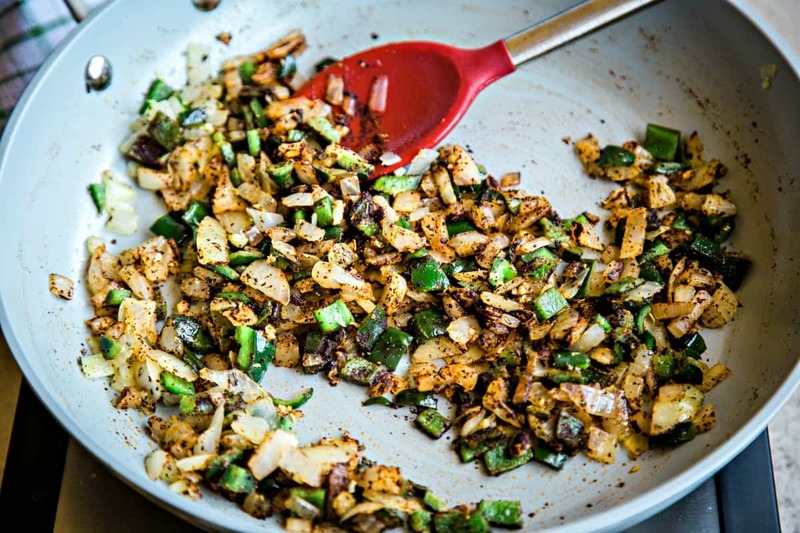 First, sauté diced onion and poblano pepper in a tablespoon of olive oil for 5 minutes, or until tender. 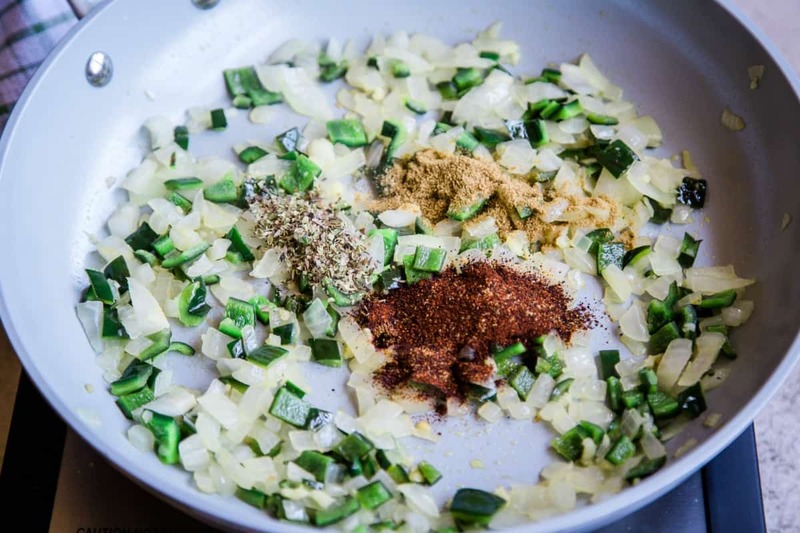 Add chili powder, cumin, and oregano and continue cooking for a couple of minutes to allow the spices to bloom, or become fragrant and start to release their flavors. 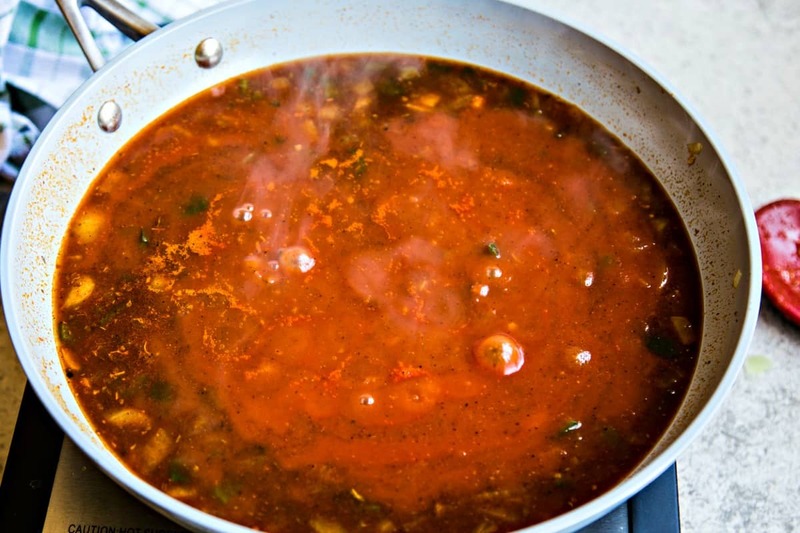 Next, add tomato sauce, chicken broth, and the diced chipotle pepper (in adobo sauce) and bring the mixture to a boil. Reduce the heat and simmer for another 5 minutes or until the mixture thickens up a bit. Prepare the chicken filling. Add 3 cups shredded chicken to a large bowl. I purchase a rotisserie chicken from my grocery store’s deli that has already been removed from the bone and shredded and it’s a great time saver! To the chicken, add a can of rinsed and drained black beans and half the enchilada sauce. Stir it up with a cup of shredded cheese. Note: If you are prepping for a party, the sauce and filling can be made ahead of time, but you’ll want to assemble the enchiladas just before baking for the best results. Assemble the enchiladas. Lightly coat a casserole dish with cooking spray. 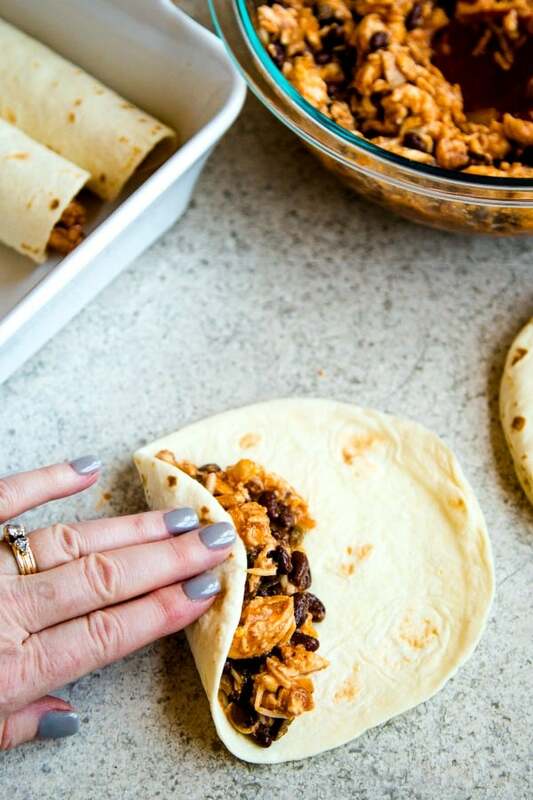 Place about one-quarter cup of the chicken filling down the middle of a flour or corn tortilla and roll up tightly. Place each enchilada in the casserole dish with the seam side down. Note: You may need to use two casserole dishes to fit them all in! Add more sauce and cheese. Pour the remaining sauce all over the top of the enchiladas and sprinkle with more cheese. Bake for 30 minutes at 350 degrees until the cheese is melted and the enchiladas are bubbly. You’re going to love the aroma when you open the oven door! 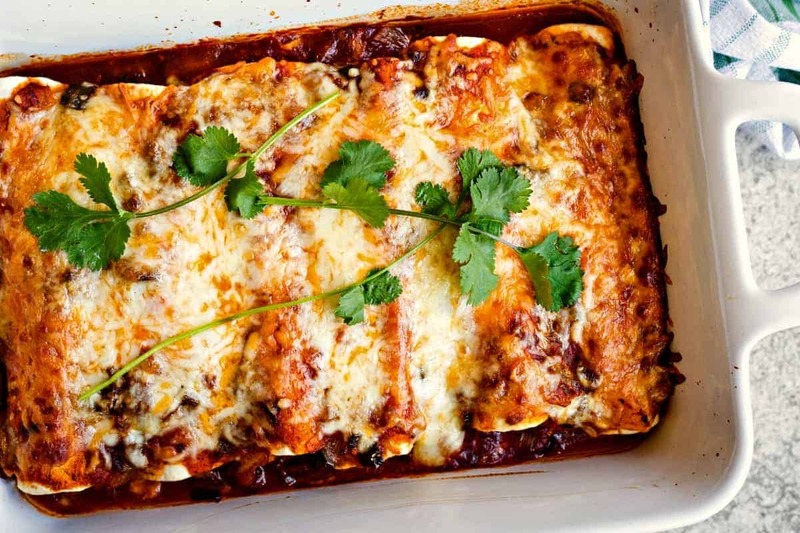 What’s the best kind of cheese to use in enchiladas? When making enchiladas, you want to use a cheese that melts easily and will be creamy. 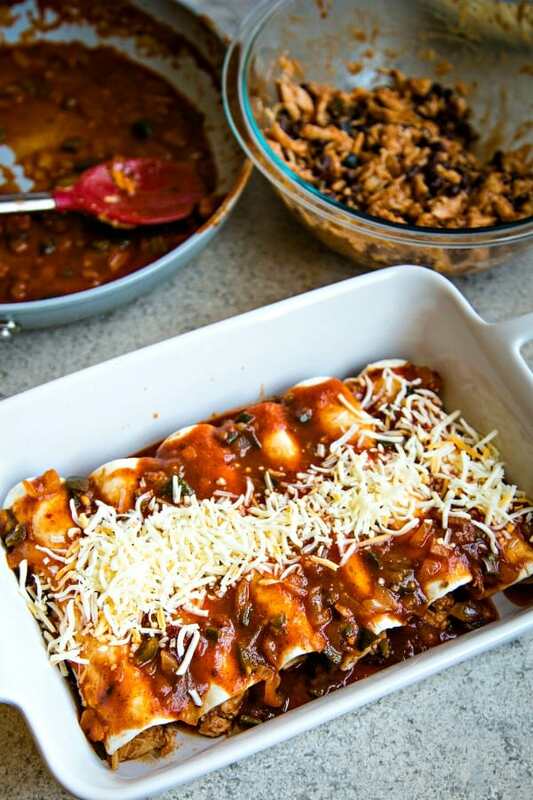 In this Chicken Black Bean Enchiladas recipe I use a Cheddar Jack Cheese, which is a mix of cheddar and Monterey Jack. You could also use a mix of mozzarella and cheddar cheeses or even white American cheese. Easy serving options for enchiladas. In most Mexican restaurants, enchiladas are served with a side of Mexican rice and refried beans. We really like the Rice-a-Roni Spanish Rice which is convenient and can be prepared while the enchiladas bake. Another tasty side dish option is this Mexican Street Corn Salad. When ready to serve, garnish the enchiladas with fresh cilantro and serve with sour cream and jarred salsa, if desired. 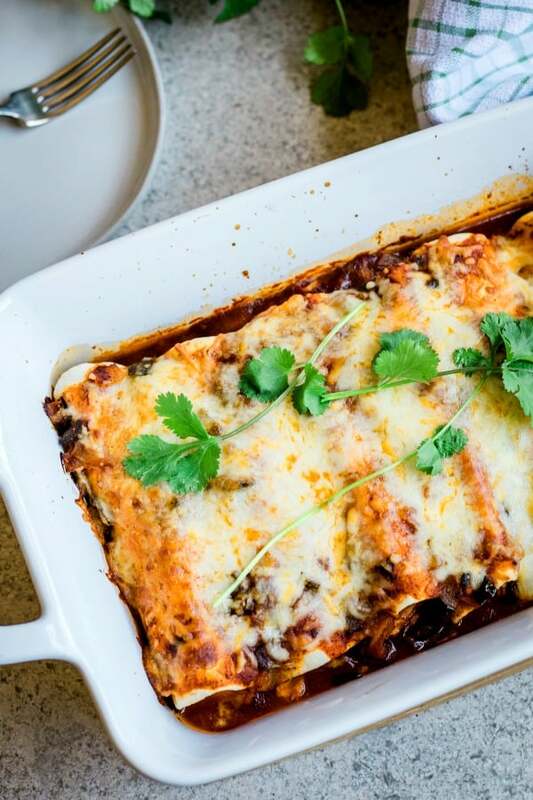 Did you make this Chicken Black Bean Enchiladas recipe? Chicken Black Bean Enchiladas with a chunky homemade enchilada sauce made with onions, poblano pepper, and smoky chipotle chilies. Preheat oven to 350 degrees. Lightly coat a casserole dish with cooking spray and set aside. Heat olive oil in a large skillet over medium heat. Add the poblano pepper, onion, and garlic and cook for about 5 minutes until the veggies are tender. Stir in the chili powder, oregano, and cumin and cook another minute to allow the spices to bloom. Add the tomato sauce, chicken broth, and diced chipotle chili and bring to a boil. Reduce heat and simmer for 5 minutes. 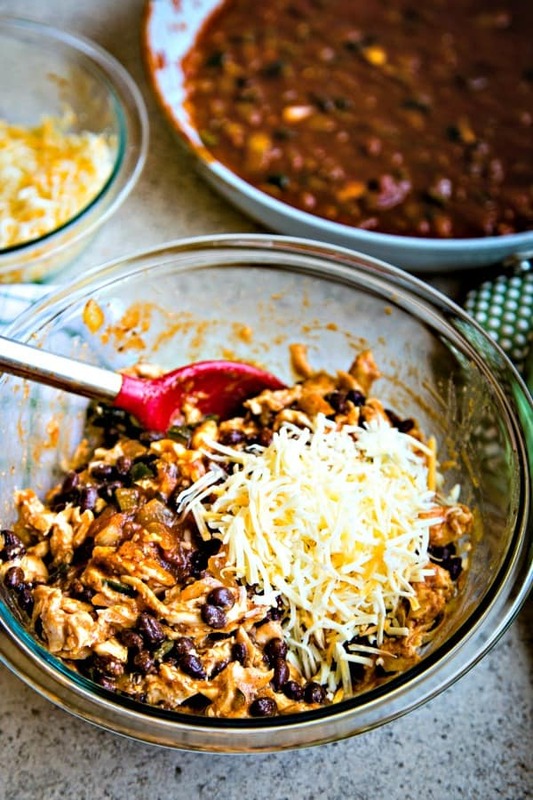 In a large bowl, combine the chicken, black beans, half the sauce, and 1 cup of cheese. Place 1/3 cup of the chicken mixture down the center of each tortilla, roll up, and place seam side down in the prepared casserole dish. Pour remaining sauce over top and top with remaining cheese. Bake uncovered for 30 minutes or until cheese is melted and bubbly.